There have been brutal murders, harrowing dangers and unspeakable acts. But, for me, this was one of the most difficult episodes of The Americans to watch. Elizabeth, still reeling from her conversation with Martha last week and jealous that Philip shows a different side of himself to Martha (and perhaps just plain insecure), demands that Philip make love to her like Clark makes love to Martha. At first, Philip just dons Clark’s costume. But that’s not enough for Elizabeth. “She said he was an animal. I want you to just be Clark,” she insists. He makes love to her in an aggressive, unsettling way. She’s left naked on the bed sobbing as Philip tears off his Clark wig, disgusted with himself. It was an emotionally devastating scene. Elizabeth and Philip both know that their respective significant other sleeps with other people, acts romantic with other people, and seduces other people. But this might be the first time they’ve both fully faced the harsh reality of their duplicitous lives head on. Amidst this strife, there’s still work to be done. The hunt for Leanne and Emmett’s killer continues. Under the guise of being CIA agents, Elizabeth and Philip meet with the man Claudia suspects killed Leanne and Emmett. They don’t believe he did it but learn valuable intel from him about the U.S. covert training of Nicaraguan Contras. Elizabeth turns to Lucia, the Sandinista agent she helped a few episodes ago. Now she needs Lucia’s help to get into a congressman’s office without detection. Elizabeth tells Lucia she must kill the congressional aide she’s “dating.” Lucia gives her “amor” a lethal drug so his death can look like a drug overdose. It’s interesting that the show spent time showing us Lucia killing someone. We aren’t that invested in her as a character or her clueless congressional aide. Was it merely to show what things might have been like for Elizabeth early on, or will we be seeing more of Lucia? Meanwhile, Oleg tells Stan he wants all the FBI surveillance logs on him or he will reveal Nina’s secret. For a while, it looks like Stan toys with the idea of betraying his country. He even gets the logs from the FBI’s spanking new computer logging system. He goes to visit Agent Gaad, who is definitely not pleased by the surprise visit. “Has it occurred to you that you might be the one in over your head,” Gaad asks him. In the end, Stan tells Nina he can bring her into safety, extract her, but first she must take a lie detector test. A panicked Nina immediately accuses Stan of not trusting her and not loving her. How will she get herself out of this one? If she turns to the KGB, the fact that she originally betrayed them might come out. If she turns to Stan, he may soon learn she’s a triple agent. “I knew I’d end up dead,” Nina laments. At the end of the episode, we learn why Claudia has been in such a scared, panicked state. She confesses to Elizabeth that she began seeing a man and eventually told him who she really was. She is afraid this man may be the one who killed Emmett and Leanne. Elizabeth and Peter need to investigate her. “I was wrong about Philip. You’re lucky to have him. Goodbye Elizabeth,” she says. —“How’s your new handler? She graduate high school yet?” I love Claudia. I hope we haven’t seen the last of her. —The title of the episode comes from Sandy getting a new red door for the house. “I thought a lot about the color,” she tells Stan. An interesting and rather dismissive juxtaposition of the issues Stan and Sandy are dealing with. —Twice now the series has shown us how Elizabeth gets information transmitted when it’s urgent. She gets a call from someone pretending to be Columbia Record House or a newspaper delivery service. We’ve never really seen this type of communication before, and I have to wonder why the show is emphasizing it now. Will it be used against them at some point? —Paige has dropped out of volleyball in favor of attending youth group meetings. “It’s mostly just music and snacks,” she tells her mother. Hmmm … I doubt that. —I typically have a problem when the female characters on screen are naked more often than the male characters (a frequent and egregious double standard). But the amount of skin Keri Russell showed in this episode was warranted. The first time, it showed the intimacy of her relationship with Philip, and the second, her utter vulnerability and exposure. 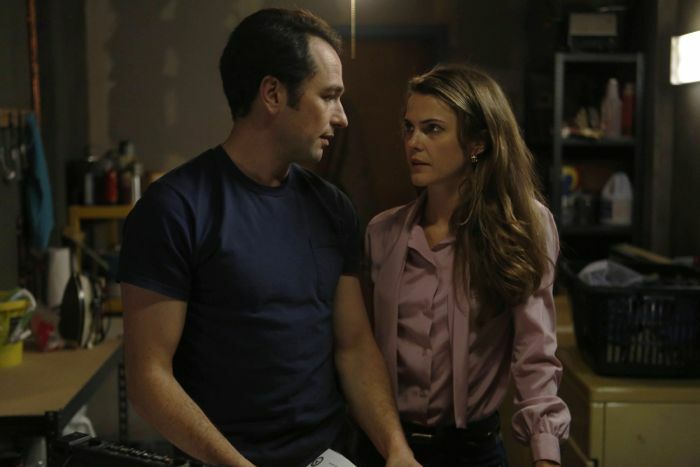 What did you think of tonight’s episode of The Americans? Are you worried for Nina? Were you as emotionally devastated watching the Elizabeth and Philip scene as I was? Talk about it below.